Home > News > News > Looking for a Great Holiday Gift? Why not make your holiday gift shopping quick and easy this year? AMT Gift Cards are the perfect choice for anyone on your list. An AMT Gift Card can be u sed toward Original Show and Celebrity Concert tickets, and also in our concession stand and gift shop. Gift Cards can be purchased in any denomination, and never expire. To make your holiday gift giving simple and stress free, consider AMT Gift Cards. You can click here to purchase online, or call us at 800-648-4102 to speak with one of our helpful Reservationists. Gift cards can be redeemed in person, over the phone, or online. 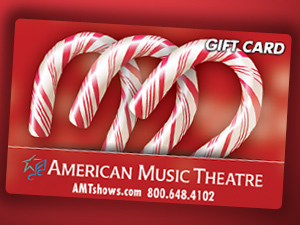 Give the gift of entertainment this year – Give an AMT Gift Card!